The prosperous age forecasted by Mort soon came to be and even the specter of famine soon disappeared from the collective memory of the citizens of advanced economies. Indeed, by the late 19th century, even disaster relief had become truly globalized. One minor problem created by the unparalleled reliability and security of our fossil-fuel powered globalized food supply chain is that too many people have completely lost track of the risks inherent to food production. 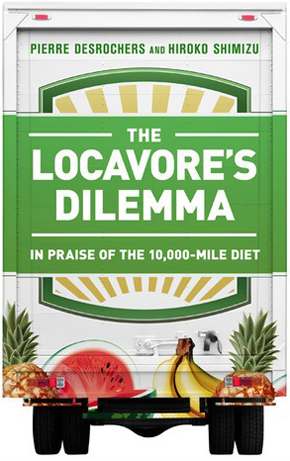 This wouldn’t be problematic if so-called “locavores” hadn’t so successfully pushed the idea of drastically increasing our reliance on local “foodsheds” (a determined radius – such as 100 miles – from their home). The last year, however, served as a useful reminder of the risks inherent in putting all of one’s food security eggs in a regional basket. In the northeast alone, a late frost devastated fruit orchards. This was later followed by what in many regions turned out to be the worst drought in 50 years. To top it all off, hurricane Sandy destroyed much infrastructure. Luckily for northeastern locavores though, they were not yet living in their utopia and, as a result, in most cases did not even have to skip a meal. Few of them, however, gave thanks to the people who developed new drought resistant corn and soybean varieties that mitigated the impact of the drought, to producers in other locations who enjoyed a good growing season and were happy to sell them a portion of their crops, and to logistics industry workers who were able to deliver them. The diversification of our food supply sources via cost-effective, large-scale, long-distance transportation is one of the great unappreciated wonders of our age, but this development wasn’t lost on its first beneficiaries. By contrast, to a locavore, food security is best achieved by giving up on large-scale monocultures and embracing polycultures (the raising at the same time and place of more than one species of plant or animal). If a crop fails, they tell you, you will always have something else to fall back upon. Yet, they are apparently unaware that this was the food security strategy pursued by subsistence farmers (who lacked good transportation infrastructure) throughout history. Unfortunately for the quasi self-sufficient peasants of old, polycultures not only delivered mediocre yields, but they also provided very little protection against natural calamities like frost, droughts, and hurricanes. Indeed, whatever the location and time, diversified subsistence farmers were typically malnourished and periodically starved – and when they escape recurring famine today, it is because relief efforts are able to deliver the over-abundance of much more productive monocultural crops grown in distant locations. It is our hope that one of the main lessons (re)learned in 2012 is that the best way to improve the security of humanity’s food supply is to press forward with specialized large-scale production in the world’s most suitable locations, backed up with ever more scientific research and greater reliance on (for the foreseeable future) carbon fuel-powered long-distance trade. 1. Thomas Sutcliffe Mort, speech delivered on September 2, 1875, Lithgow Valley Works (Australia). Quoted in “Mort, Thomas Sutcliffe (1816-1878)” in David Blair. 1881. Cyclopaedia of Australasia. Fergusson & Moore, Printers and Publishers, pp. 245-247. 2. George Dodd. 1856. The Food of London: A sketch of the chief varieties, sources of supply, probable quantities, modes of arrival, processes of manufacture, suspected adulteration, and machinery of distribution, of the food for a community of two millions and a half. Longman, Brown, Green and Longmans, p. 27. 3. William Wilson Hunter. 1871. The Annals of Rural Bengal, fourth edition. Smith, Elder and Co, p. 55.